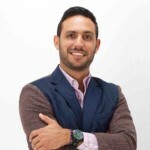 Jochy Mesa Perez is the Director of Business Development for Firecracker International, a disruptive technology consultancy that works to catalyze innovation within a company and transform good ideas into values. By providing innovation services, the firm helps companies become stronger competitors and make a positive impact in the workplace, marketplace and community. An established business professional with more than 10 years of professional business experience, Jochy is seasoned in marketing for the healthcare and pharmaceutical sectors, as well as salesforce training and project management. He has overseen projects for major laboratories across Mexico and Central America, for industry heavy hitters, including Abbott, Abbvie, Philips Healthcare, Roche, Astrazeneca, Merck Sharp & Dohme, Merck Serono, Boehringer Ingelheim, Leo Pharma, Rimsa, Italmex, and Teva, among others. Prior to joining Firecracker International in April 2016, Jochy served as the Sales Director and Customer Support for Miramar Outsourcing. He resides in Narberch, Pensylvania, where he is a member of the HCAT Marketing Subcommittee of The Greater Philadelphia Chamber of Commerce, and the Young Professionals Network (YPN) of the GPCC. International Society of Business Leaders Member Jochy Mesa Perez can be found on the Society Directory, where he is looking forward to networking with you.